We all have scars, but nobody is willing to accept it. I for one am proud to accept that I have scars. Both on the inside and on the outside. 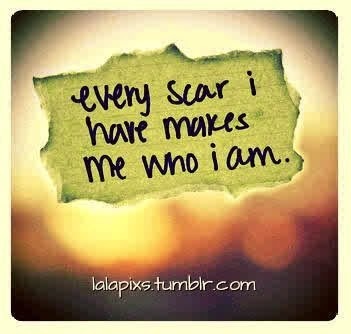 I am not ashamed of my scars, infact every scar has been a lesson or an experience for me. When I look at myself in the mirror, I look flawless as the scars are hidden under a layer of make-up. But when I'm stripped to my own skin, I see them. Up, close and personal. I also see the scars hidden inside me. The scars present in my heart and my soul. It's natural for me to look deep, once I look into the mirror. Exactly why it is important for me to do good. I want to look into the mirror and feel good about myself. The day I'm unable to do so, would be the day I have failed in life. Thankfully that has not happened until now. I look into the mirror and feel good about myself. Yes, irrespective of the scars. I have a scar on my right forearm. This was from when I was a baby and rolled onto a hot iron box. This reminds me of how naughty and playful I am. There is a scar just below my right wrist. This was from the first time I decided to shave. Along with the razor, came a thin strip of skin. This reminds me of my entry into womanhood. There is a scar right at the middle of my back. Its pretty big and it actually is a birthmark. My father has the exact same scar at the exact same place. This reminds me of the love that we share. During my birthday last year, hubby and I traveled to Munnar. While we were driving up the ghats, he spotted a waterfall and wanted to play in the water. We stopped the car and he rushed under the water to soak himself. I ran behind him trying to get past the barbed wire around the area. My leg got stuck and the wire tore a part of my jeans and my skin. That left a long gash on my right thigh. It looks bad when I wear skirts and shorts, but I will never get that removed. It reminds me of the smile on my husband's face as he played in the water. It also reminds me that it is okay to let go and enjoy the small moments in life. A few scars on my face are due to the chicken pox I had during my seventh board exams. And yet I emerged the topper. They remind me of the fact that I'm a winner and not a quitter. I had the option to take the exam later as I was down with severe fever too during that time. But I did not give up and prepared myself for the exams and I came out with flying colors. The other scars on my face and body remind me of my ongoing battle with PCOS. I have not won it yet, but I'm sure with time I shall come out of it completely. I'm not giving up on it. It doesn't look pretty I know, but my hormones seem to have some unsaid vengeance against me. I'm doing my best to combat this syndrome, but it is fighting me back with all its strength. And I'm standing against it with all that I have. These scars remind me of the strength I did not know that I had. These scars show me that no matter how bad today is, tomorrow will be clear and beautiful. I can easily go to a doctor and get all these scars removed by shelling out a few thousands. But I do not want to do it. I want them on me as a part of myself. A few of them will fade away with time, but will always remain a part of me. As a learning. As an experience. As an extension of myself. There are a few scars on my heart and soul as well. They are not going anywhere. It represents people whom I had once loved. Not necessarily lovers. These are the people whom I trusted and who stabbed me in the back instead, leaving me with a scar. These internal scars teach me how to not trust people easily. It reminds me to stay away from certain people. And it tells me that it is okay to hate a few people because that is exactly what they deserve. Such people are already a scar on this flawless earth. It is the people that are flawed, not the world. Nothing can help erase that. Scars are not something to be frowned upon. I have accepted them as a part of me and I'm proud of them. Yes, I hide them when I step outside. Because I want them to be just a part of me. What I'm proud of will be ugly to the other's eye. I do not want to hear tips on getting rid of them or questions regarding how I got them. That is why I have embraced makeup and kept the secret to myself. Nobody else need to know the stories behind them. Some people get tattoos done to remind them of experiences. I chose to keep my scars instead. Thank you for reading Prasanna! I have a scar on my temple. I call it my harry potter scar :P Each scar is a memory. Interesting post, that reminds me of one my own scars and lovely memories aorund them! Thanks. I'm such a tomboy, I don't even realize that my scars, which I hardly even notice, might not exactly be eye candy to other people, until they ask me how I got it.. I guess I don't really care. Lovely post, all of us have scars - but I always think of the scars that damage people; brings down their self esteem and some times breaks their personalities leading them towards mental illness and at other times even to death... these scars for me are frightening... I too have scars and like you am able to deal with the scars positively and move on... not everyone can do it... thanks for making me reflect and think.. it was a great post. I wish that people start doing it. 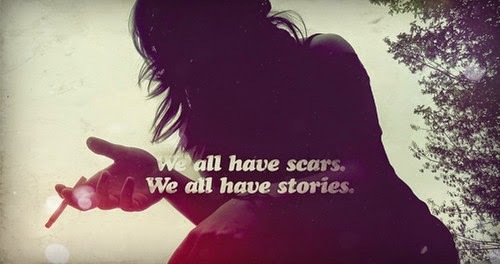 It's true, scars are memories, scars are lessons, scars are reminders of the past and they also show that we have healed! Loved this post, Soumya for the positivity that emanated from it! A powerful write up! Its all about perspective! This one touched my heart. I prefer my scars over tatoos too. More power to you girl. Scars are often reminiscent of loved ones or a memory which left an impact on us . Your post proves just that . Oh ho, that would be difficult to explain. Hide it now! I don't think you can live life without acquiring scars both internally and externally. Anything that's natural shouldn't be removed just for the sake of aesthetics. Scars are symbols of the mistakes we did and the lessons we learnt. We need both of them to form the memory that makes us smile over years of time. such a beautiful writeup!! U chose to leave your scars on, associating them with a part of your life that you cherish and that is lovely!! how many would be brave to do that? I did howl a lot I believe!